There is a critical need for new technologies to accelerate or improve the healing of chronic soft tissue wounds. Funded by the National Institutes of Health, Professor Diane Dalecki and Denise Hocking lead a multidisciplinary research program to develop the use of ultrasound in chronic wound therapy. Current efforts concentrate on using ultrasound to enhance cell growth and contractility, stimulate epithelial cell migration, and promote collagen organization and mechanical strength in tissues. Working with our collaborators, the team is also investigating the use of ultrasound to noninvasively regulate arterial tone and increase blood flow to tissues. 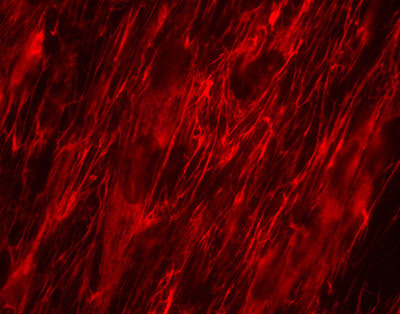 Immunofluorescence image of the extracellular matrix protein, fibronectin, after assembly into fine fibrillar strands by fibroblasts. This line of research has been funded by the National Institutes of Health (NIH). Biomedical ultrasound, acoustics, lithotripsy, biological effects of ultrasound.